There more than 12,000 species of roundworms. They have a smooth outer wall (are not segmented). Where they occur, they are very plentiful. A shovelful of soil can have hundreds of thousands of roundworms living in it. Range and Habitat: Nematodes are found throughout the world in all habitats – from saltwater (marine) and freshwater habitats to soil habitats beneath your feet. 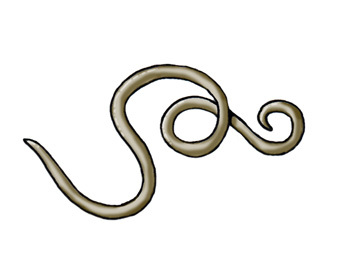 The most dangerous parasitic roundworm forms are found in tropical climates. They have a simple nervous system made up of a ring of ganglia at one end attached to two simple nerve cords, one on top (dorsal) and one on bottom (ventral) that run the length of the body. Diet: Roundworms have a variety of lifestyles from carnivore, herbivore, and scavenger to parasites. Most are parasites, however, and many affect humans, like pinworms and hookworms. Ascaris, an intestinal parasite, lives in the soil in warm climates. Trichinella roundworms develop in the muscle tissue of animals. Humans can be infected by the worm when they eat undercooked pork. This is called trichinosis and is very serious, as the worm develops cysts in the muscle that cause permanent damage. 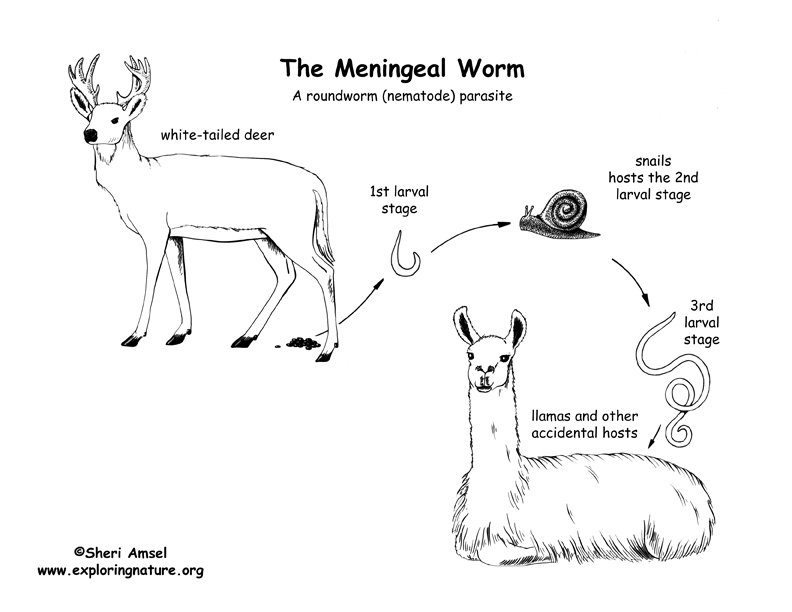 The meningeal worm affects deer, llamas and other livestock.